After training as a dancer at Rambert School of Ballet & Contemporary Dance, Max discovered his passion and talent for choreographing his own works and creating the costumes and designs for them. He has gone on to study for an MA in Costume Design for Performance at London College of Fashion. Max’s approach to design stems from his passion for transforming spaces and bodies, being able to create an atmosphere or convey a feeling, thought or idea. 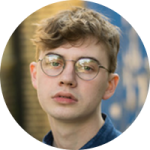 Max considers the blank and sterile spaces of theatres a perfect place to create something visually striking, and believes the aesthetic elements of a performance are just as crucial as the performance itself.